Buy tickets online at www.clydetheatre.com, over the phone at (800) 514-3849 or in person at The Clyde box office, Wooden Nickel Records, Neat Neat Neat Records, and Sweetwater Sound. Hairball is a Rock & Roll experience you won't soon forget! The lights, sound, smoke, and fire...to merely call it a concert would be like calling Mount Rushmore a roadside attraction! Vocalists Joe, Kris and Bobby lead the band through a 2+ hour, mind-blowing, and drop-dead accurate homage to some of the biggest arena acts in the world. Van Halen, KISS, Motley Crue, Queen, Journey, and Aerosmith are but a few of the acts fans will see brought to life. 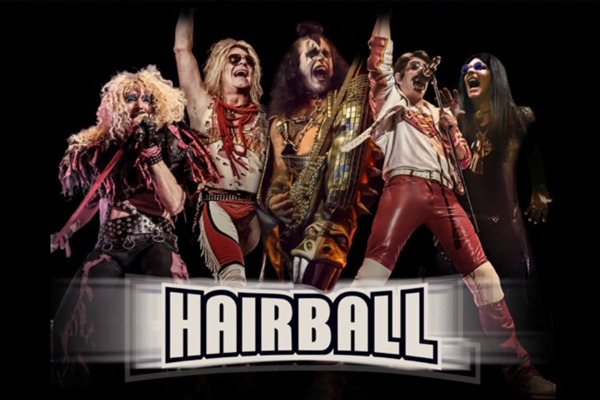 The Hairball stage becomes an entirely new rock concert before your very eyes countless times throughout the night. Get ready for a 100% full-on, no-holds-barred, exciting, chaotic, fiery party that has to be experienced to be believed!